Furious customers are demanding their money back from an under fire timber business after goods and services failed to materialise. 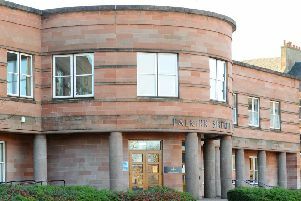 McFadden’s Timber – also known as McFadden’s Door Centre – in Dalderse Avenue, Falkirk, has been the subject of a myriad of online complaints and more than a few e-mails and calls to The Falkirk Herald over the last week. According to over a dozen angry customers they are out of pocket to the tune of thousands of pounds after the products they ordered were not delivered and jobs were not carried out. James Rutherford said his grandparents were owed £800 by McFadden. He added: “They gave McFadden the money and then McFadden cancelled the order. Another customer claimed: “Repeated attempts to contact the company to either carry out the work or return the cash, handed over in good faith, have been met with a wall of silence. The Falkirk Herald visited Mcfadden Timber on Monday and met with business owner Vincent McFadden, who denied his firm, which he said had been trading for 26 years, was in any financial difficulty. He said: “I have had health problems and was forced to close the business due to ill health at times. Everyone I owe money to for orders that have not been fulfilled has been contacted personally and the situation explained. The Falkirk Herald contacted local trading standards officers about the high volume of complaints surrounding Mr McFadden’s business and was still awaiting a response as the newspaper went to press.